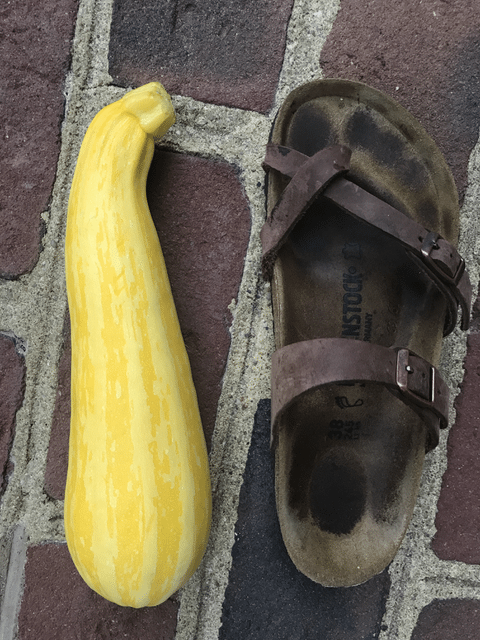 I have updated this post from 2009 since we recently came home with a large yellow zucchini from a trip. 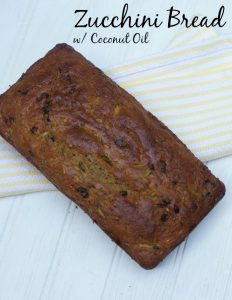 When your zucchini gets too big and filled with too many seeds to enjoy sauteed, you can easily resort to a zucchini quick bread recipe that everyone will love. 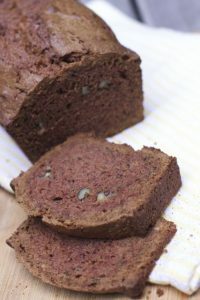 Yes it is a Low fat Chocolate Zucchini Bread Recipe that is filled with cocoa powder, chocolate chips and zucchini. Trust me the kids wont even know what they are really eating unless you tell them. This post may contain affiliate links. You can also learn How to Cook That Massive Zucchini That’s Growing in Your Garden from Bon Appetit. After being gone for 10 days I have proof that people are honest in this world. I came home to a 5 lb zucchini this weekend. Which says 1 of 2 things, people are not out to get the fruits of my labor or the folks I offered harvesting rights to, just did not know when it would be ready to be harvested! Unfortunately, at this size you can not just cut it up and make salads or even just saute it with some olive oil. The best solution to use up this mass amount on produce was to shred it up and make zucchini breads, 4 loaves and I still have another half to use! When shredding this amount of zucchini, 4 cups in total, I chose to use the shredder disc on my Cuisinart food processor. I was also afraid of the stiff skin would be trouble getting through a traditional grater. I was able to use a traditional grater for the smaller size but if you have a lot a shredder disc will make things go faster. 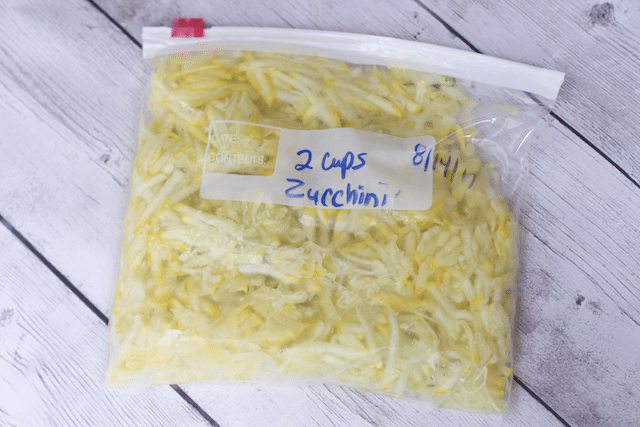 With any extra zucchini shreds, simply put them in a freezer bag and use them in your future baking endeavors. 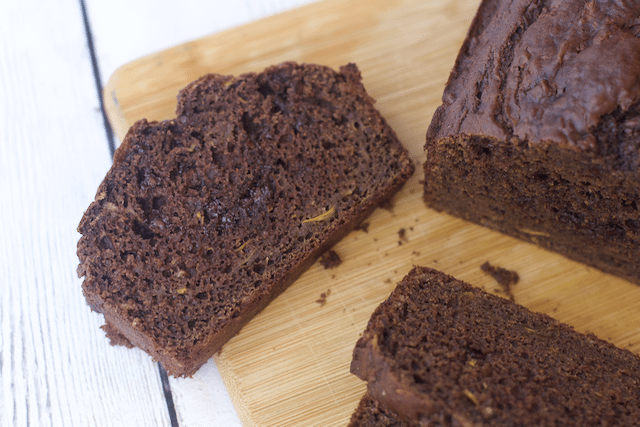 This recipe makes two loaf pans of this yummy snack bread. You can easily freeze one, but it disappears pretty quickly in my house. To make sure the loaves bake evenly, be sure each pan is filled with an even amount of batter. This time I actually measured and hopefully this will help you as well. 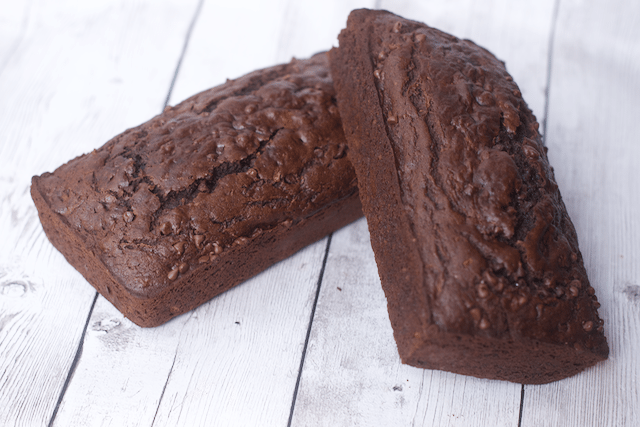 One way to trick your kids to eat their veggies in the chocolately zucchini quick bread recipe. Preheat oven to 350’ Spray two 8x4 inch loaf pans with non-stick spray. Set aside. 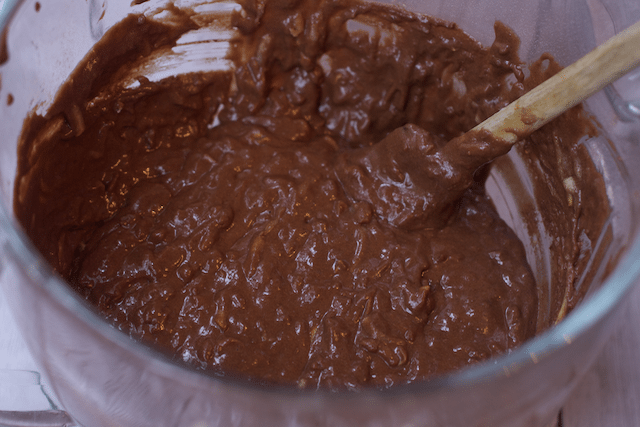 Spread batter evenly in prepared pans. Bake for 50 minutes (25 minutes for smaller loaves) or until toothpick inserted in center of loaf comes out clean. Cool for 5 minutes in pans and let cool on a wire rack before serving. 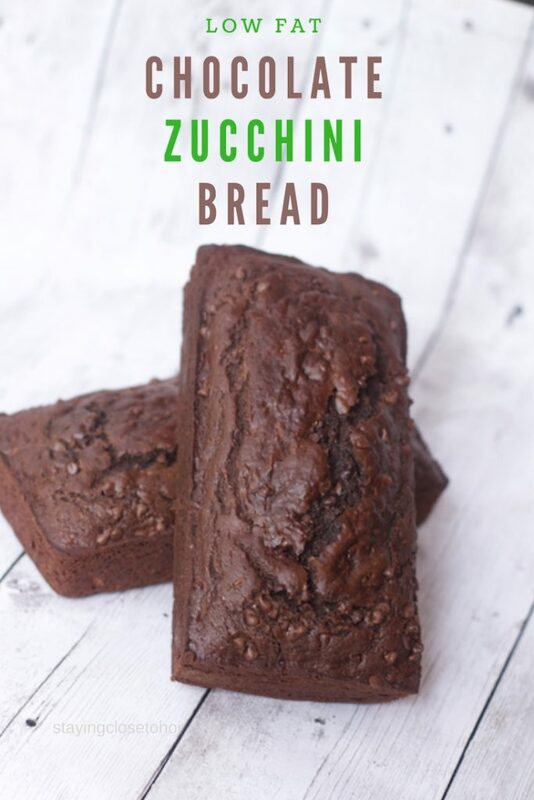 Never tried this Zucchini bread before but adding this to a chocolate bread – I’m sold. I wish I had such luck with my veggie garden!! 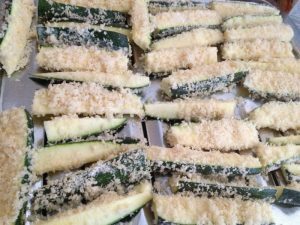 Sadly, I started mine a little too late this year so I never got around to planting zucchini plants…even if I did, I have a bad habit of picking the buds and frying them up with sauce rather than leaving them to grow! 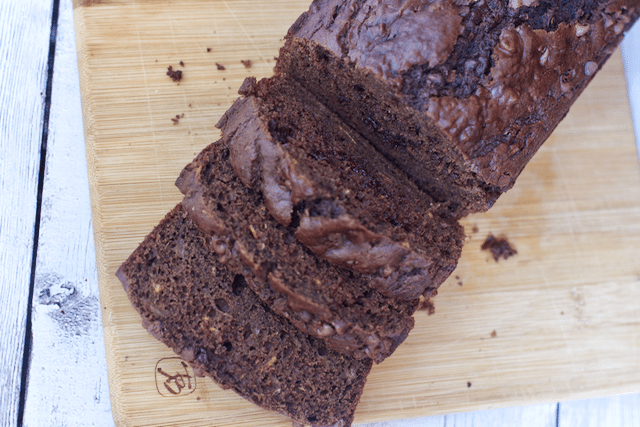 This chocolate zucchini loaf sounds so good! I wish I had a slice right now. my italian grandmother used to make the flowers!! 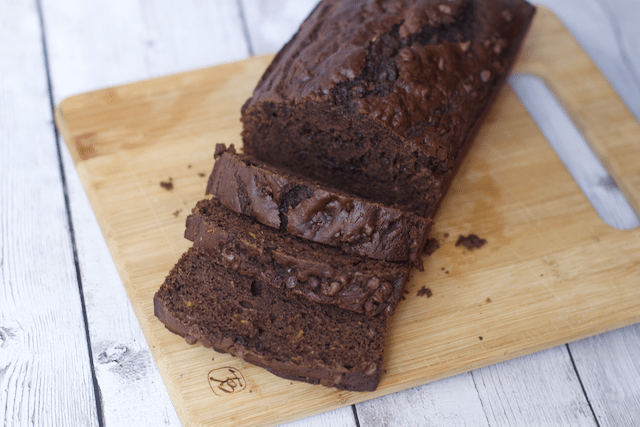 Lovely looking recipe, chocolate is always a winner! I always grow dinky zucchinis. There are years where I wonder if i should just pluck the flowers and use those instead haha so this is really cool to read! I am trying to get Terry to eat more zucchini too so this would be an awesome thing to make without him knowing it’s in there!